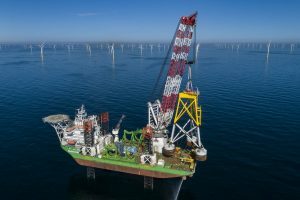 On 30 July, the last suction bucket jacket foundation landed on the seabed at the Borkum Riffgrund 2 offshore windfarm in Germany. With this milestone, GeoSea completes the installation of 20 suction bucket jackets. Borkum Riffgrund 2, owned by Ørsted and Global Infrastructure Partners, will feature 56 Vestas turbines of 8MW and have a total capacity of 450MW – enough to supply electricity to approximately 460,000 households. GeoSea’s scope involved the transport and installation of 20 suction bucket jackets, each weighing 950t and having a height of 58m. This is the first time Ørsted has utilised this type of foundation at one of its windfarms on such a large scale. In 2014, GeoSea installed the first ever suction bucket jacket at Ørsted’s wind farm Borkum Riffgrund 1. GeoSea’s ‘Innovation’ is now being mobilised in Vlissingen to head to the Hornsea Project One windfarm in the UK, where GeoSea is currently installing 174 foundations.